So, Rufus Hound eh? Comedian, actor, Whovian and all round affable chap. Rufus Hound reading a Short Trip. Rufus Hound reading a short trip and obviously having a ball – because his sheer joy at being involved in the project is obvious from the life that he brings in to the story. But why Mr Hound, usually these stories are read by a companion from the time? Well dear reader, for those of you who are spoiler averse then read no further and go and listen to The Black Hole available here and review here. Have you all gone, done that and are up to date? Then I will continue. 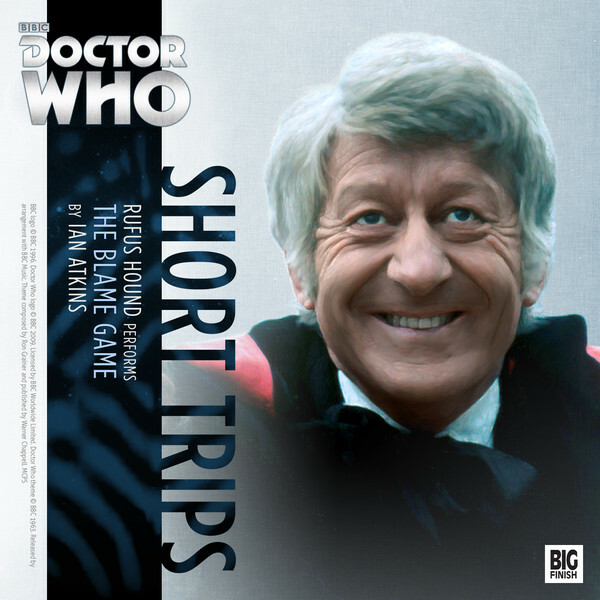 As well as narrating Rufus plays The Meddling Monk in this Short Trip reprising his role from The Black Hole and this story sees him arrive early in the Pertwee era, sometime after The Silurians and make the Doctor an offer her cannot refuse – he offers to take him off earth to travel with him. Unfortunately the Time Lords are not so easily outwitted and soon The Doctor, Monk & Liz Shaw are stranded on a Dolphin (them of the eyebrow communication) spaceship. To make it worse the ship is on a collision course. What writer Ian Atkins has achieved in this story is an examination of what it is for a Time Lord to be stranded – the Monk describes it to Liz in terms I had not considered previously, and what a terrible thing that has been done to the Doctor stranding him on Earth, but also what a terrible thing that The Doctor did to the Monk stranding him in the TV story The Dalek’s Masterplan, because if stranding the Monk did one thing, it gave him a lot of time to think of a suitable bit of payback. An excellent character study of both the Doctor & the Monk written in shades of grey with Liz Shaw as the moral compass that both desperately need. I blame the blame game for my decision to award 9/10. To escape his Earth exile, the Doctor is prepared to make any bargain, come to any arrangement, or to do any deal with any devil – even if in this case the Devil wears a monk’s robes. But when past misdeeds start catching up with both the Doctor and the Monk, who can Liz Shaw trust when time is running out and death is rapidly approaching?